Josh Smith is a polarizing player. Some consider him every bit as good as the tremendous highlights and monster box scores, while others point to his iffy attitude and questionable shot selection. 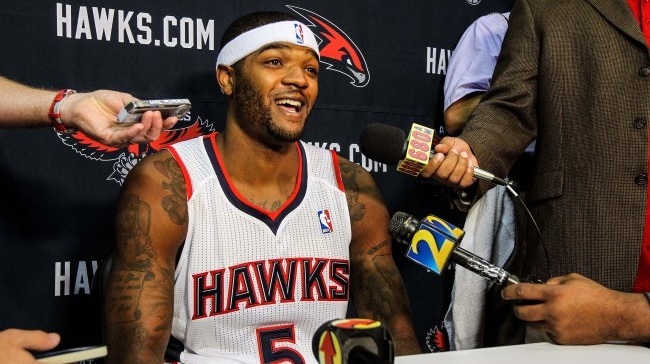 Honestly, I don’t know how to rate Josh Smith. He brings an awful lot to the table, including the coveted ability to score on the block (when the mood strikes him, of course), and yet… something is missing. His insistence on taking those fall-away jumpers indicates a lack of consistent effort and focus. Smith will still get max money this summer, and watching how he responds to it will be interesting. Maybe a change of scenery will do him well, or maybe Josh Smith is set in his ways. It’s been awesome to watch the NBA begin to embrace advanced statistics. On Thursday, the league publicly opened the doors to its massive database, which was previously available only to media members. Jared Dubin tries to make sense of the muddled Western Conference playoff picture. The weekend is already upon us, but you ought to take a listen to Bo Churney and Robert Kalland’s delightful anti All-Star podcast. A couple of weeks ago, you may have seen the trailer for a web series featuring Chris Douglas-Roberts. Here’s episode one. The Celtics and Clippers reportedly continue to discuss a trade that would send Kevin Garnett to Los Angeles for Eric Bledsoe and DeAndre Jordan, which seems to make little sense. Not because it’s a horrible deal, but because KG has publicly stated he has no intentions of waving his no-trade clause under any circumstances. Someone has dedicated a Tumblr account to Craig Sager’s suits. It appears that updates are made frequently, although last night’s curios ensemble hasn’t yet been submitted. Seriously, what in the hell is that material? Here are all [insert large number here; I lost count] of Kenneth Faried’s dunks from Friday’s Rising Stars Challenge. Yahoo BDL’s Dan Devine caught up with three of tonight’s dunkers. Gerald Green is excited, and that is exciting.